TAMPA, Fla. (AP) There’s only one team the Atlanta Falcons need to be concerned about the rest of the way. The defending NFC champions trail division rivals New Orleans and Carolina by one game with two weeks remaining in the regular season. But if the Falcons (9-5) beat the Saints (10-4) and Panthers (10-4), they win the NFC South again . One victory in the final two games guarantees Atlanta a playoff berth. Devonta Freeman had 194 yards from scrimmage – rushing for 126 on 22 carries and catching five passes for a team-high 68 yards – to pace Atlanta’s fifth victory in six games, which eliminated Green Bay from playoff contention. Ryan threw for 212 yards, a touchdown and no interceptions. Freeman’s 32-yard TD run gave Atlanta a 10-point lead that the defense nearly let slip away over the final eight minutes. The 5-foot-6, 206-pound running back kept pounding away at the Bucs defense until finally finding his way into the open field, darting through a gaping hole on the right side before cutting back to elude the only defender with a shot at tackling him on his way to the end zone. With Freeman’s sidekick, Tevin Coleman, out with a concussion, third-string running back Terron Ward shared the rushing load with the two-time 1,000-yard rusher. ”I saw him hit the sideline. And, Free one-on-one with anyone in the open field, I’m taking Free,” Ward said. Jameis Winston had his sharpest performance of the season for the Bucs (4-10), who have lost nine of 11 following a 2-1 start. The third-year pro completed 27 of 35 passes for 299 yards and three TDs with no turnovers. He had TD passes of 30 yards to O.J. Howard, 42 yards to Mike Evans and 16 yards to Adam Humphries, the latter pulling Tampa Bay to 24-21 with four minutes remaining. The Bucs got the ball back with a minute left. Winston completed three passes, moving them into position to allow Patrick Murray to try a 54-yard field goal that sailed wide right on the final play. Falcons wide receiver Julio Jones had a monster game against the Bucs three weeks ago with 12 receptions for 253 yards and two TDs in a 34-20 win at Atlanta. Tampa Bay knew it needed to do a better job against him to have any chance this time. 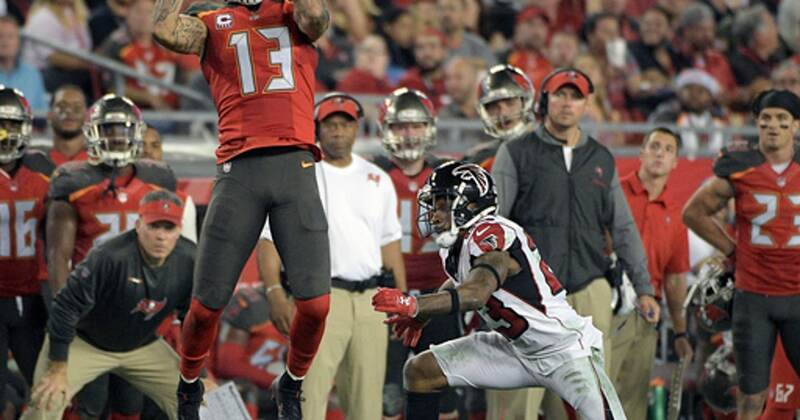 Ryan targeted the star receiver eight times Monday night, but Jones only had three catches for 54 yards. The Falcons offset the drop in production, finishing with 201 yards rushing. Former Bucs coach Jon Gruden, who has spent the past nine seasons as ESPN’s game analyst on Monday Night Football, was inducted into the Ring of Honor at Raymond James Stadium during a halftime ceremony. Gruden was acquired from the Oakland Raiders for two first-round draft picks, two second-round draft picks and $8 million before leading the 2002 Bucs to the club’s only Super Bowl championship in his first season in Tampa Bay. Gruden was fired after the 2008 season and moved into the broadcast booth the following year. The Bucs haven’t made the playoffs since 2007 and don’t have a postseason win since their Super Bowl run 15 years ago.